We are pleased to announce that Blidworth Oaks Primary School in Nottinghamshire has won our School Allotment Plot Competition. The judges were impressed by the involvement of the children in the garden and the wider benefits, the fact that chickens were also being cared for and the use of produce in the school kitchen. The children will receive a trophy and plaque along with gardening seeds and £250 of gardening vouchers from Nature’s Path. We had a fine set of entries and St Teresa's Primary School, St Helens and Charlton Manor Primary School were close runner-ups. There will be more details about all the wonderful entries in the next issue of our magazine. Many thanks to Nature's Path a family firm and producer of organic and gluten free cereal who are proud to be supporting Schools Allotment Week. Nature's Path actively encourages the education of kids and families about the environment and our planet. The company feel that Schools Allotment Week is another important campaign that can teach our future generations about the value of taking care of the environment around us. Well done to all those children and supporting adults for this great project! Since starting our school vegetable garden in 2012 the effect of out door learning on our children has been fantastic. Children who found difficulty engaging with school have found a new purpose and those who needed a little extra time have found a safe and peaceful place. Beyond that though the vast amount of children in school have become enthused to try new foods, our school kitchen is regularly stocked with veg from the allotment, and many of our children now talk about their own allotments or what they are growing at home…usually with grandad! Over the years we have extended the allotment to include a poly tunnel and now are able to host a class for an outdoor lesson at any time of the year. This can range from a Science to Maths with some English on the way. 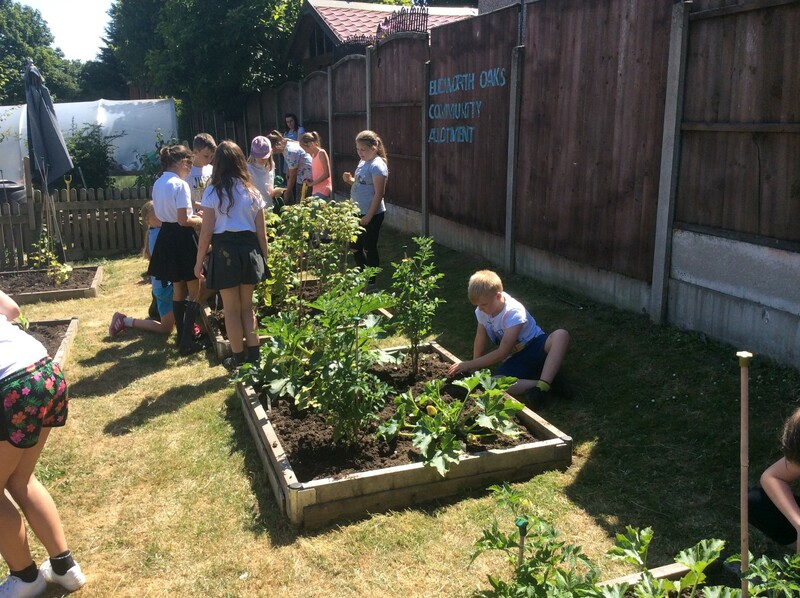 Children love learning outdoors and the pictures below show some of our older children (year 5/6 aged 10/11) weeding and watering the beds we have created….I think I may have even captured one or two of them sneaking a cheeky raspberry! 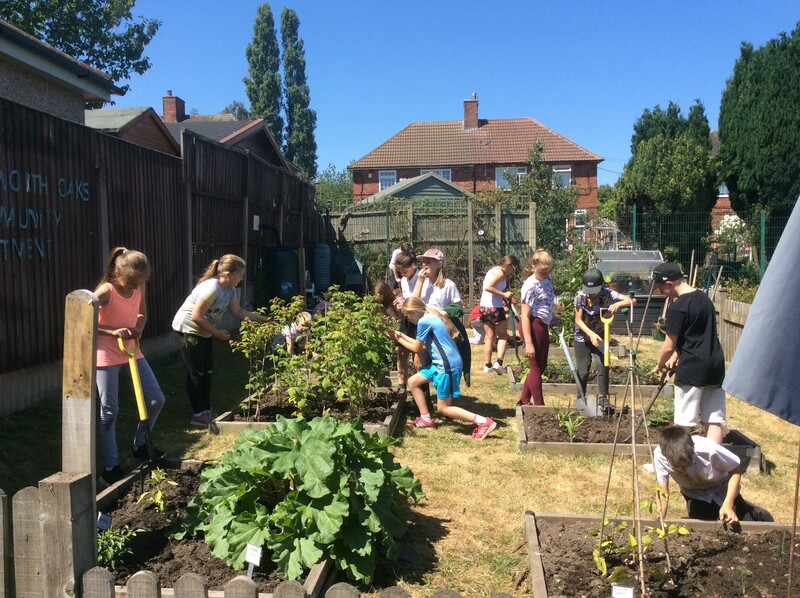 Each year following the school summer holiday we hold blitz clubs where we invite parents to come and work along side their children in preparing the allotment for the winter, hence we call our allotment the Blidworth Oaks Community Allotment. More recently we have introduced chickens to our allotment area and each lunchtime a group of year 6 children hold and look after the chickens encouraging younger children to take part. All in all, thanks to the allotment,we are able to teach our children about their environment and healthy eating along with conservation and recycling whilst also bringing everyday skills that children need but in a fun and relaxed atmosphere. We are lucky enough to have won the East Midlands in Bloom award for best Fruit and Vegetable garden in the East Midlands In 2016 and in 2017 our school grounds won the title of Best School Gardens in the East Midlands.